Apart from the gym, the largest room on station is the galley. It's the only place that everyone visits at least once a day, it's your best bet for finding entertainment on a slow evening, it's our auditorium, our cafe, our bar, and our backup TV lounge. The galley is the social hub of the station, and - of course - the source of all our food. The flags from the signatory nations (to the Antarctic Treaty) - which flew outside all summer long around the ceremonial pole - hang along the walls. The many large windows which have been blacked out since sunset, and three large overhead TV's play the scroll on an infinite loop. It may look a little industrial at first glance, but after six or seven months on the ice, the galley is as comfortable and comforting as anywhere on station. 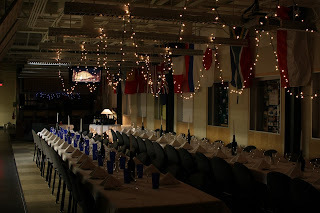 On special occasions like Midwinter, we dress the it up, and the galley can become genuinely lovely. Of course, its primary purpose is to feed the crew, and the kitchen staff do an admirable job with that. We get 3 square meals a day, usually with a couple of options at each, and are free to dig through leftovers or prepare something on our own whenever we feel a bit peckish. Beyond simply feeding the body, the galley at mealtimes is where people gather, sit, chat, and get a moment away from the day-to-day drudgery of work. Because of that association with relaxation and socializing, people tend to congregate there in the evenings as well. Through the summer, the galley was always pretty busy. With 250 people on station working every hour of the day and night, just keeping everyone fed kept it humming 24/7. 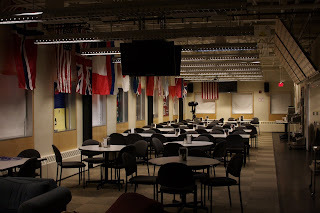 Since the population dropped to 60 for winter, it's calmed down a lot: first thing after station close, half of the tables were removed, and one end was designated a lounge area, complete with comfy chairs and a couple of couches. Most times of day or night, you can find someone reading, resting, or just fast asleep there on a couch. The Galley - beating heart of the South Pole Station.